VMBO 2018 will be held at the VUA Amterdam, The Netherlands. 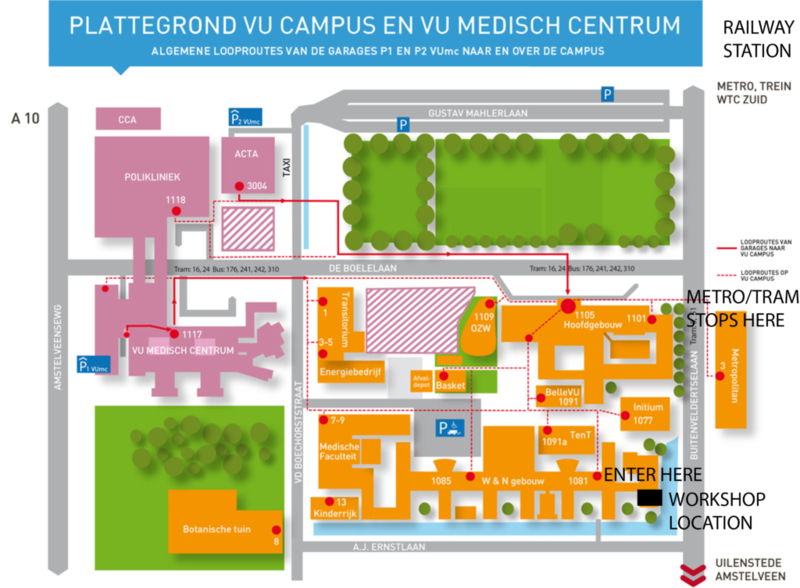 The VUA campus, is just one train stop away from Schiphol airport. Moreover, the Thalys (international high speed train) also stops at Schiphol airport. There are hotels in the neighbourhood of the university campus (walking distance). If participants want to stay in the city centre in Amsterdam that is also possible. The VU campus can be reached by metro or tram from the city centre. The VUA can be reached by train, metro or tram. From Schiphol airport: Any train to Utrecht or further (Eindhoven, Nijmegen) stops at Amsterdam Zuid. The trains usually departs from platform 3. Do not use the train to Amsterdam Central station as it will not pass Amsterdam Zuid. If you arrive at the platform in Amsterdam Zuid, walk into the direction the train came from. At the end of the platform, take the stairs and go left. Use your train ticket to checkout. After the checkout gate you can either take a tram (5), or walk. It takes about 1o minutes to walk. In case you take the tram, get out at the Boelelaan VU stop. If you decide to walk, go into the direction of the gas station. At the next junction, you will see the VU campus. Plan your journey at the site of the Dutch railways. From the city centre: Take tram 5 (Amstelveen, Binnenhof ) or metro 51 (Westwijk) and get out at the Boelelaan VU stop. To travel with publication transportation you need a ticket which you use to check in and check out. The tram requires you check in/out inside the tram, whereas the metro requires checkin/checkout at the platform. Plan your journey at the site of the Amsterdam public transportation. The workshop is taking place in the “Tuinzaal” on the ground floor of the Science building (W&N) of the VU Amsterdam. Take entrance nr. 1081. Once through the swing door, follow directions, the “Tuinzaal” is straight in front of you.